If you're a thrill ride junkie like me, you'll probably have heard that the Battlestar Galactica (BSG) rides have re-opened at Universal Studios Singapore. They unveiled the rides on 21 Feb to the media, and nervous though some of us were, we were absolutely delighted to experience world's tallest pair of duelling roller coasters. If you have a fear of heights, challenge it as you go 14-storeys above ground. The start also involves a sudden acceleration to the top and it slows down to let you see the full view just as you go over the edge. 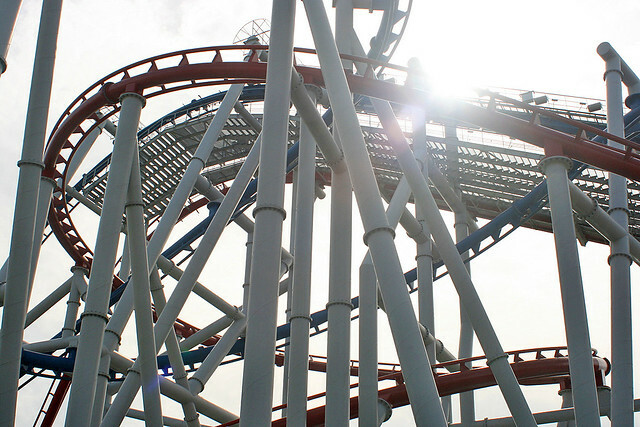 Lifts, drops, inversions, a Zero-G roll, corkscrews and spins - all part of the 90-second thrill ride! Choose your side. The "Human" side has you seated, and the "Cylon" side has you suspended, with legs dangling (many barefeet!). Both sides appear to engage in aerial battle, zipping around as fast as 90km/hr! There are near collisions mere inches apart, but honestly, while we were up there, we didn't really see the other side. We were too busy screaming! So which side was more fun? Personally for me, the Human side felt like a warmup. Good for beginners. 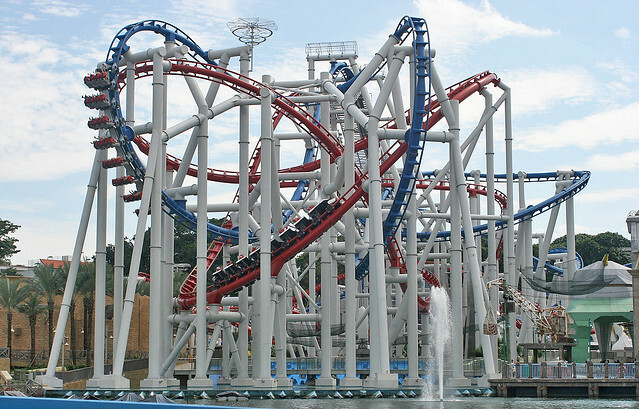 The Cylon ride is something you absolutely have to try. It's more terrifying and fun. We all felt 10 years younger after the exhiliration. And interestingly, all the girl bloggers (Dawn Yang, myself, Eunice Khong and her friend) loved it so much, we went for seconds! 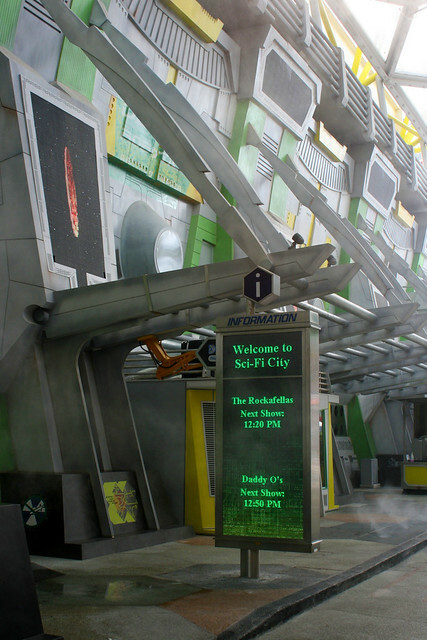 Sci-fi City is where you'll find the Battlestar Galactica rides. There's a shop with really cool BSG merchandise. I bought a ton of stuff (hubby is a big BSG fan and I love the series too - both old and new). Later on, I needed to exchange a t-shirt because the sizing is surprisingly smaller than US sizes. The staff at Guest Services outside the entrance came all the way inside to the BSG PX shop to get me what I needed. Thumbs up for wonderful service! 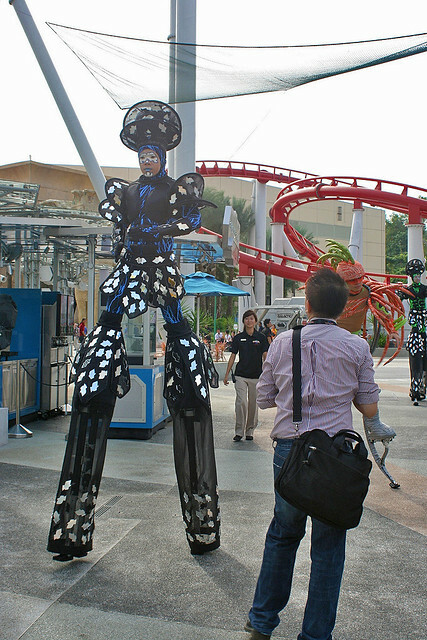 You'll see all kinds of stiltwalkers at Universal Studios, and I noticed they now use metal stilts with complex cushioning contraptions and teeny tiny feet! 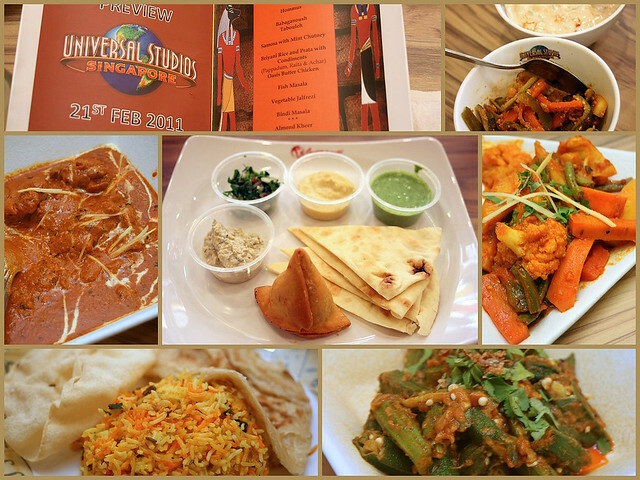 There are lots of eateries within Universal Studios. 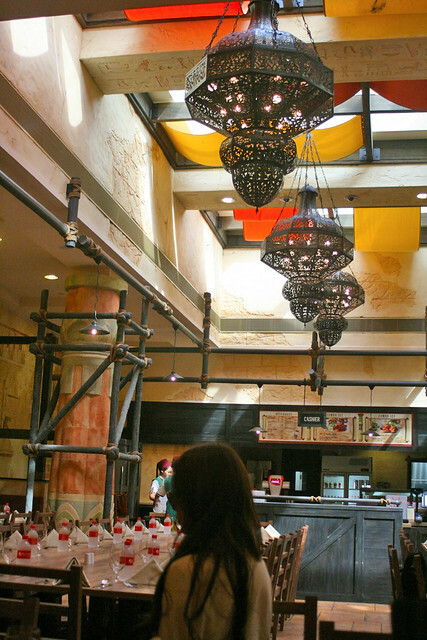 After the ride, we were treated to lunch at Oasis Spices Cafe, a halal buffetaria serving Indian, Lebanese, Mediterranean and Turkish accented fare. I really liked the airy and atmospheric interior. The food is actually quite good, but we were so full of post-ride adrenalin that we did not feel hungry. Still, I polished off whatever I was served. Butter chicken, fish masala, vegetables jalfrezi, bindi (ladies fingers) masala, briyani rice and prata with papadum, raita and achar. The starter platter of pita bread served with hummus, babaganoush tabouleh, samosa and mint chutney was quite filling in itself. The bigger question was - could we go for the rides after a heavy meal like this? Haha, we did not tempt fate, but all of us had earlier kept our breakfasts intact after the rides. So I would not worry too much about eating before riding. We were free to roam around the theme park afterwards. There are about seven zones each with its own theme (Ancient Egypt, Sci-Fi City, The Lost World, New York City, Hollywood, Madagascar and Far Far Away). Most of them have their own rides and attractions. 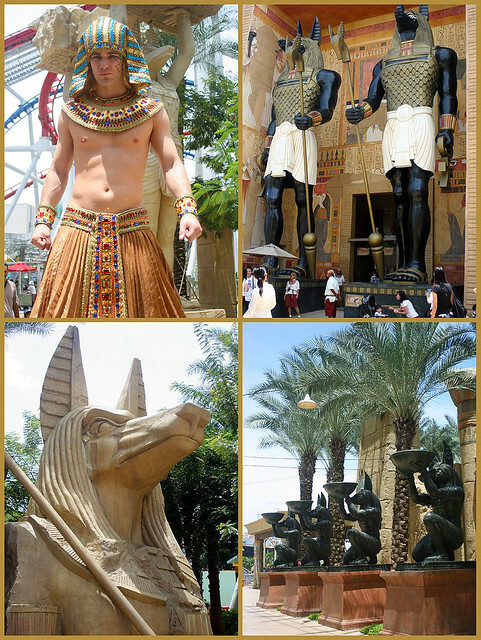 I strongly recommend the Ancient Egypt's Revenge of the Mummy ride where you plunge into total darkness on a psychological thrill ride. 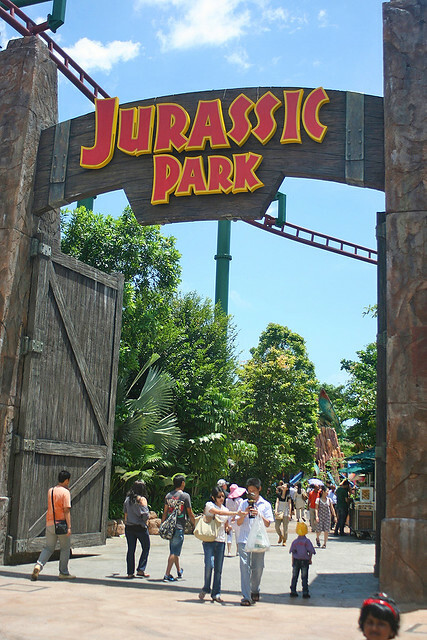 Prehistoric thrills await within Jurassic Park - try the Canopy Flyer or get soaked in the Rapids adventure. Kids can go for the Dino-Soarin Pteranodon ride. There is also a food court nearby with a full-scale T-rex skeleton as a central feature. Far, Far Away is right here! 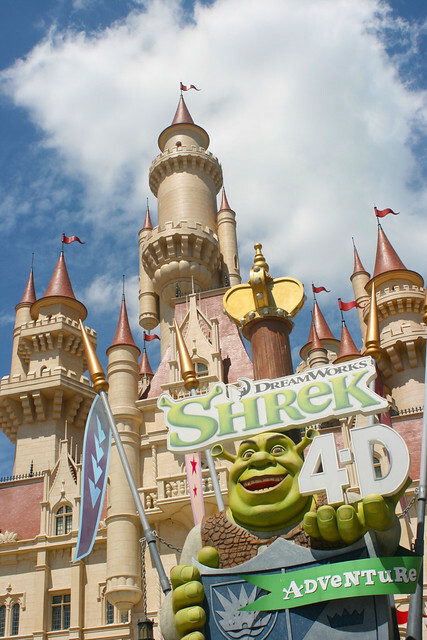 There's a 4D movie adventure within the castle, where you can see, hear and feel the action from jolting seats. 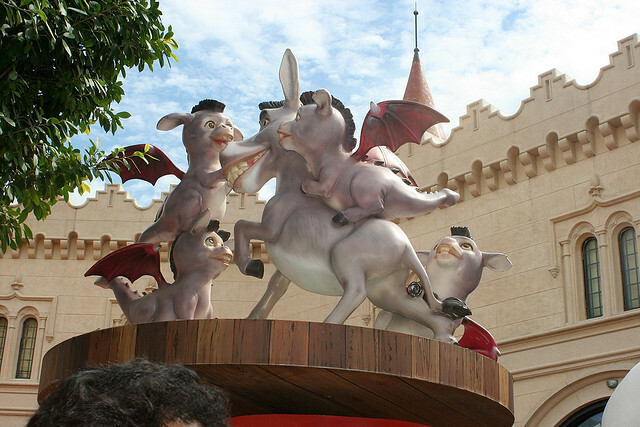 The Enchanted Airways may be a junior roller coaster but it can feel even more scary than the Battlestar Galactica one (which has you securely strapped in)! 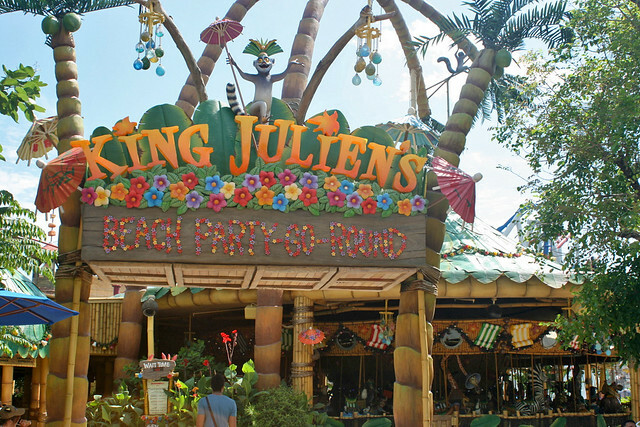 At the Madagascar section, King Julien rules! He's my favourite in the movie. 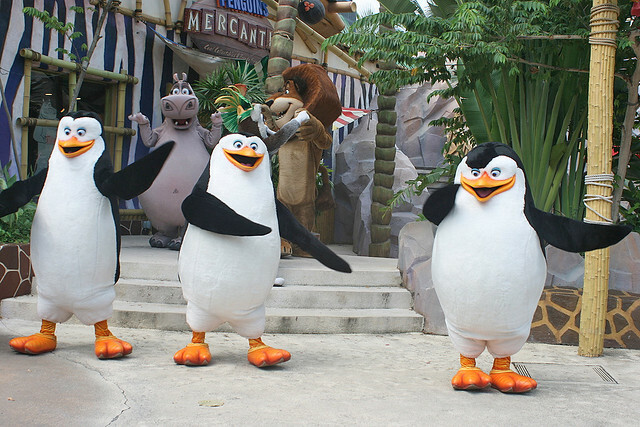 Live performances from the movie "cast" featuring the penguins of Madagascar. 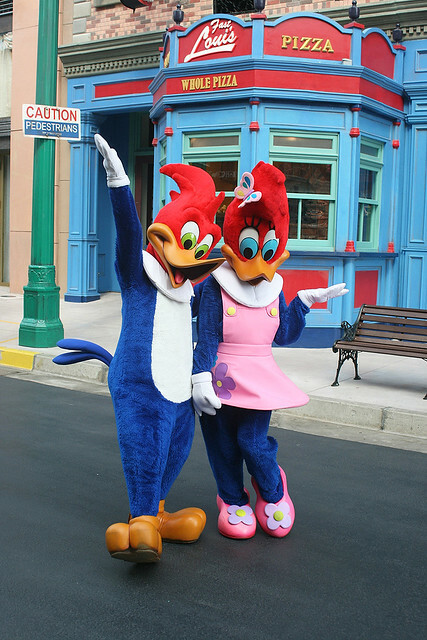 In the Hollywood and New York City sections, you'll bump into all sorts of characters. Of course, all the perennial favourite cartoon characters are there too. 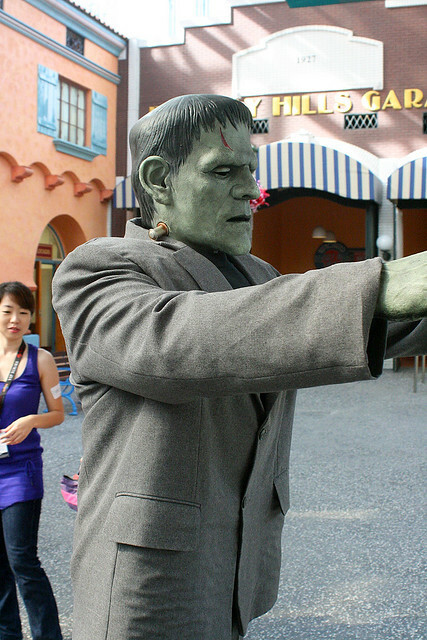 So that was my first time at Universal Studios Singapore. Some friends of mine have the signed up for annual passes, so they can go in as often as they like! 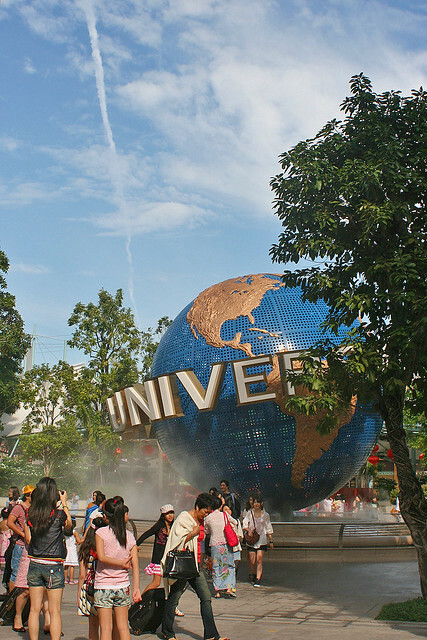 Thanks to Matthew from Universal Studios Singapore and Resort World Sentosa for such a thrilling experience and fun day out. Thanks, also, Walter, for hooking us up!